BROWARD COUNTY, FL -- Broward County&apos;s Port Everglades exceeded one-million TEUs (20-foot equivalent units, the industry&apos;s standard container measurement), for the third consecutive year, reporting a total of almost 1.04 million TEUs and maintaining its status as Florida&apos;s number one container port, according to preliminary data for the fiscal year ending September 30, 2016. Compared to the prior fiscal year 2015, total TEUs were down by 2 percent from 1.06 million, which Port officials attribute to market fluctuations. However, Port Everglades posted its best September ever with 90,641 TEUs compared to 80,550 TEUs in 2015. Looking at growth over the past five years, TEU throughput is up almost 18 percent from FY2011 to FY2016. In addition, bulk and break bulk cargo increased 13 percent from 1.56 million tons in FY2015 to 1.76 million tons in FY2016. Petroleum volumes also increased by 3.6 percent from more than 116.8 million barrels in FY2015 to 121.1 million barrels in FY2016. Major milestones for Port Everglades this past year include renewing long-term agreements with three major terminal operators - Florida International Terminal, LLC (FIT), King Ocean Services Limited (Cayman Islands) Inc., and Crowley Liner Services. In addition, NYK Line has launched its new, monthly "Magellan Straits Express" South America RoRo service from Port Everglades beginning today. Ongoing capital improvements and expansion ensure that Port Everglades continues to handle future growth in container traffic. 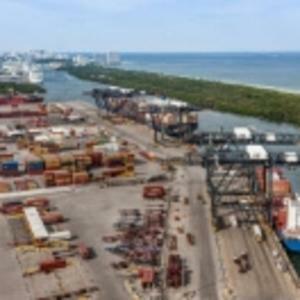 The State of Florida has allocated more than $125.1 million in State grants to Port Everglades&apos; expansion efforts over the next five years. On the waterside, the U.S. Army Corps of Engineers has approved a long-awaited economic and environmental report that cleared the way for Port Everglades to begin the preconstruction engineering and design phase to deepen and widen its channels from 42 feet to 48-50 feet. In addition, the Port&apos;s Southport Turning Notch Extension project will lengthen the existing deep-water turn-around area for cargo ships from 900 feet to 2,400 feet, resulting in up to five new cargo berths. The Port will also be adding up to six new Super Post-Panamax gantry cranes in Southport. Landside, several multi-million-dollar infrastructure improvements have improved connections with South Florida&apos;s major highway and railroad systems. At the crossroads of north-south and east-west trade, Broward County&apos;s Port Everglades is Florida&apos;s leading container port, handling more than one million TEUs and serving as a gateway to Latin America, the Caribbean, Europe and Asia. Located within the cities of Fort Lauderdale, Hollywood, and Dania Beach, Florida, Port Everglades is in the heart of one of the world&apos;s largest consumer regions, including a constant flow of approximately 110 million visitors statewide and 6 million residents within an 80-mile radius. Port Everglades has direct access to the interstate highway system and the Florida East Coast Railway&apos;s 43-acre intermodal container transfer facility, and is closer to the Atlantic Shipping Lanes than any other Southeastern U.S. port. A world-class cargo handling facility, Port Everglades serves as an ideal point of entry and departure for products shipped around the world.